Party mix is a very different animal today than it was in the ‘80s. Back then, you couldn’t buy it. You had to make it at home using the recipe printed on most Chex brand cereals boxes. And it didn’t have any breadsticks or bagel chips in it. That’s an innovation that came along in the last 15 years or so when Chex made an aggressive move to produce and market the mix as a snack. 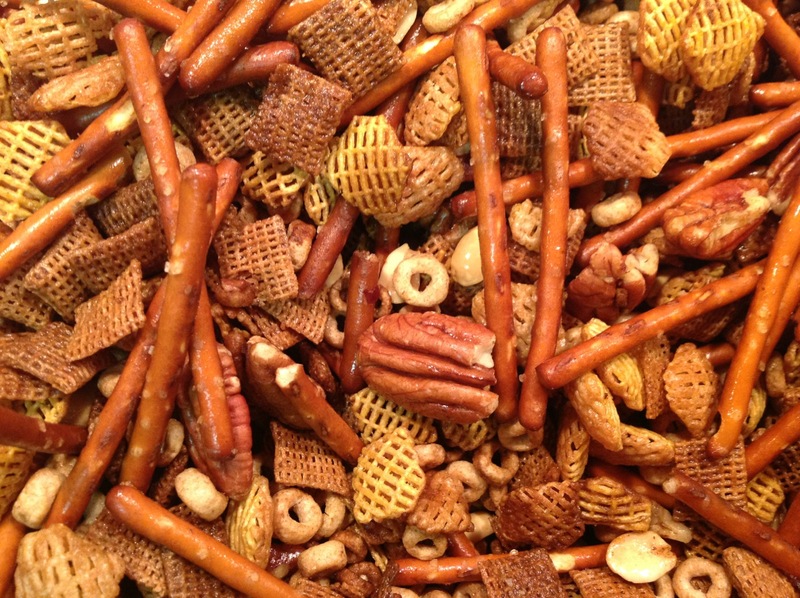 Back in the day, the mix had just four components: cereal, pretzels, nuts and salty buttery goodness. That’s the way I think it should be, so this recipe hearkens back to the days before bagel chips and “bold party blend.” Chex apparently denies those days ever existed: the recipe for The Original Chex® Party Mix calls for a cup of bagel chips, which I assure you was not in the original Original Party Mix recipe (here’s photographic proof from Flickr, note how different Wheat Chex used to look). Although it was never part of the official Chex mix recipe--rival brands assure this--a lot of people put Cheerios in their party mix. Their round shape and texture is a nice contrast with the Chex. After having party mix with Crispix in it, I also always include that. As for nuts, you can use mixed nuts or select your favorites. I always include peanuts, sometimes pecans too, depending on what’s on hand. Some recipes call for hot sauce, but I don’t put that in. This is a great thing to have around the holidays for parties or when people stop by. 2013 update: I revised the recipe a bit to include weight measures. Preheat oven to 300 F. Combine pretzels, cereals and nuts in a large roasting pan. In a medium saucepan, heat butter, Worcestershire sauce, garlic powder and seasoned salt over medium heat until the butter melts. Stir to combine and then pour over the cereal mixture. Stir to evenly coat the dry ingredients with the butter mixture. Bake in the oven for 45 minutes, stirring every 15 minutes. Allow to cool and then store in an air-tight container. Yeah, what's with all this revisionist history, Chex? And why can you only buy Wheat Chex in those small, thin boxes? I'm convinced there's a story here. Someone needs to investigate. Where's Bonnie S. Benwick? I agree it's very odd that Wheat Chex now comes in a tiny box. It looks so out of place next to Corn and Rice Chex, which still have normal-size boxes. I tried a Google search to find out, but didn't see a definitive answer. I remember reading a few years ago that the price of cereal had gone up, so I can only assume that wheat in particular is now more expensive in comparison to corn or rice as a cereal ingredient. However, we eat a wheat cereal (Frosted Mini Wheats), which don't come in such a small box, so that might not be right. Let's ask Bonnie & Co. during Free Range on Food Wednesday! I'm sorry, Mr. CookInDineOut, but you are wrong! Bagel chips, the BEST PART of Chex Mix, are one of the true original ingredients. Your confusion stems from a false consciousness about the origins of Chex Mix. Our favorite party staple was NOT invented by a profit-driven American Corporation in the 1950's, as some would like you to believe. In truth, it was the product of early 1920's Soviet food engineering, developed as a nutrient snack to keep you full while you wait in a bread line, work in the mines and/or report your parents to the secret police. The name itself, Chex Mix, means "Salty Fingers Make Puckered, Silent Lips" in Russian. And to prove the original mix contained bagel chips, you only need to look at recently-opened Soviet archives. At the link below, you will observe Joseph Stalin enjoying a bag of ORIGINAL CHEX MIX, complete with bagel chips, in a photo from the early 1930s. Comrade Stalin so enjoyed his Chex Mix that he subsequently had his own son-in-law Photoshopped out of the image, to be replaced by a human-sized bag of his favorite proletarian snack. Given this unassailable evidence, I hope you reconsider your non-conformist, bourgeois beliefs about Chex Mix. Your ideas are dangerous and can lead to anti-socialist sentiment. Thanks for straightening me out....Ben. By the way, you were right about the roosters.